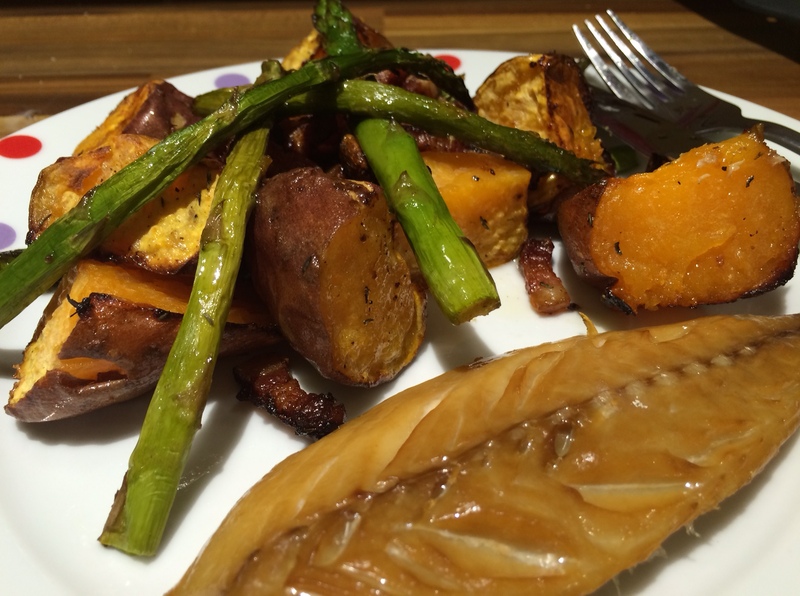 This week at Season’s Eatings, we thought we’d rampage through three recipes that we’ve recently tried with smoked mackerel – a great source of omega-3 fatty acids. We’ve used a couple of autumn / winter essential vegetables in these recipes: butternut squash and sweet potato. Both are very easy to prepare and cook as well as adding colour and flavour to your dishes. The first recipe we’ve chosen uses sweet potato and asparagus, and includes some bacon lardons too for extra flavour – when has bacon not been a good choice? 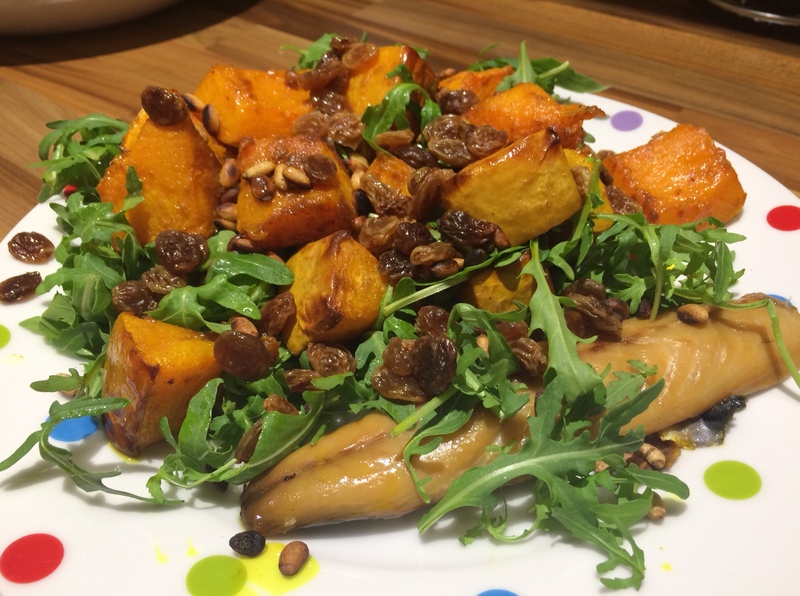 Our second recipe, based on spiced butternut squash has been finished in 2 ways: one using feta and the other using rocket and pine nuts, proof you can make delicious dishes with leftovers from the fridge! Pre-heat the oven the 200ºC. Cut the sweet potato into large (or greedy) mouth-sized pieces. Arrange in a baking dish, toss over the bacon lardons, garlic cloves (no need to peel). Drizzle with a little olive oil, thyme, a good pinch of salt and a couple of twists of freshly ground pepper. Roast in the over for 30 minutes. Then take out, add the asparagus stalks and turn everything over gently to make sure all the vegetables are covered in tasty bacon fat. Put back in the oven and cook for a further 15 – 20 minutes. 5 minutes before everything is ready to come out the oven, add a fillet of smoked mackerel. This is already cooked and ready to eat, so just needs warming through. Serve not with the vegetables piled up next to the fish. Leaving the skin on, and coring out the seeds as necessary, cut the butternut squash up into 1 inch chunks. Tip the squash pieces into a baking dish and sprinkle over the turmeric, ground ginger and a generous dribble of oil. Turn the squash over in the oil and spices to ensure every piece is well coated. Sprinkle with a pinch of salt and the put int he oven to roast for 45 mins, turning once. 5 minutes before everything is ready to come out the oven, add a fillet of smoked mackerel. 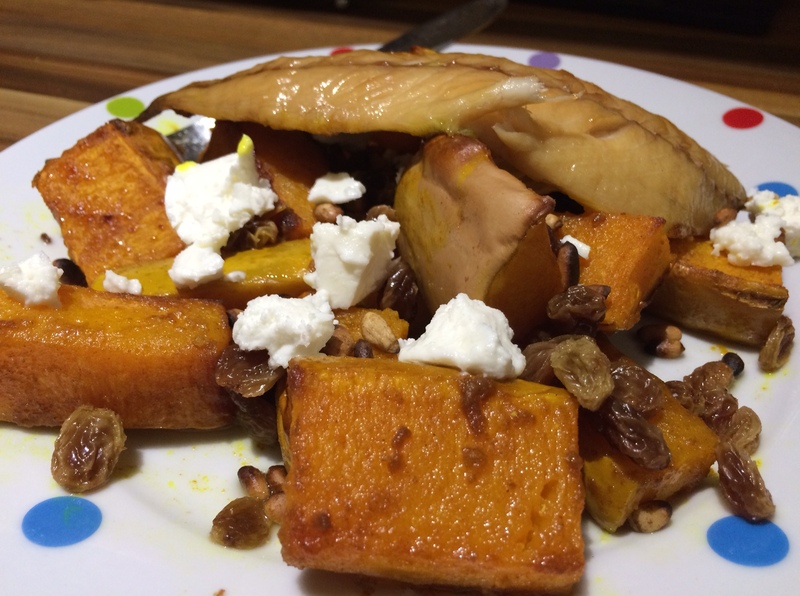 Assemble the dish by adding a portion of squash to a plate, scattering over the sultanas, pine nuts and crumbled feta. The mackerel can be kept whole or flaked. Enjoy straight away with a smoked beer or your favourite ale. In a cup (or other small receptacle of your choosing), just cover the sultanas with hot water and a splash (1/2 tbsp) of white wine vinegar. Cook the butternut squash as for the previous recipe, adding the mackerel 5 again for the last 5 minutes of cooking time to warm through. Pile up a good couple of handfuls of rocket onto your plate, then add the pieces of butternut squash, mackerel flakes, pine nuts and sultanas, dribbling over some of the water/vinegar.